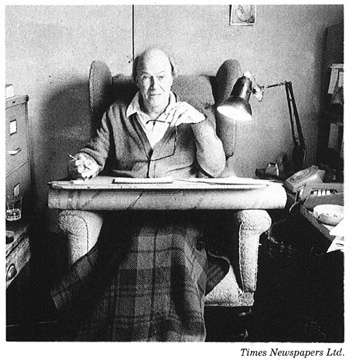 Roald Dahl sitting in his writing hut. Long before Roald Dahl wrote Charlie and the Chocolate Factory, he was already creating amazing things. When he was nine years old, he climbed to the roof of his house and rigged a line to the garage. Then he built a contraption to lower cans of water over the heads of unsuspecting visitors. Two old ladies dressed in fancy hats and skirts chit-chatted down the pathway across from Roald's house. They each had a fluffy dog bouncing on a leash. Roald steadied his hand. As the ladies inched closer and closer, their feet crossed the shadow and YANK! Water poured down the front of their jackets and onto the ground below. Their once smiling faces were now frozen, stiff with shock as water dripped from their once perfect hats. Even as he lay in bed, after having been scolded by his mother, Roald smiled knowing he had pulled off something great. When Roald became an adult, moles dug holes all over his garden. He buried empty wine bottles close to the mole hills, leaving the tops exposed. When the wind blew, the bottles would hum. This eventually drove away the moles because they couldn't stand the noise! When Roald's tennis shoes were too tight, he put bags of water inside his shoes. He placed the shoes in the freezer to see if the water turning to ice would stretch them. When he tried, they fit! As a dad, Roald made his inventions even more exciting for his kids. He strung 50 different colored glass balls in his children's rooms from the ceiling. He called them "witch balls." If a witch came in, she would see how hideous she was and run away screaming from the awful sight of her reflection! Roald invented a machine for his children using some wood, wire, a tin can and a crayon. He tied the wire from the wooden board to the top of a tin can which he had weighted down. The bottom of the can was connected to the end of a crayon. Then he hung the board and pushed the can. It moved and created patterns on paper. He constructed mini hot air balloons for his children out of tissue paper and wire. Then Roald would float the balloons into the air. Even mealtime was creative! Snacks such as Witches' Potions and Crunchy Jelly were made. Roald told stories to go with his snacks. "This is a secret recipe. A young prince in Dar es Salaam passed it on to me after I saved him from the dreadful grip of a giant python!" Life was not always fun and games for Roald, but he didn't let that stop him. When his wife had a stroke, he invented a new kind of therapy to help her feel better. This therapy is still used today by the National Stroke Association! Roald would cheer her up by making pink milk and his own invention, Hot House Eggs. Hot House Eggs were toast with a fried egg stuck in the middle. In 1960, Roald's son Theo, suffered brain damage when his stroller was hit by a car! Roald and his friend helped invent a valve that rids the brain of excess water. Theo is still alive today. His dad's invention has treated over 2,000 kids! Roald created a maze in his backyard garden and hid quotes inside. "Watch with glittering eyes the whole world around you because the greatest secrets are always hidden in the most unlikely places. Those who don't believe in magic will never find it." He wanted to inspire those around him to do great things. Interesting! I had no idea there was so much more to him than writing! Really nice short story. i love the flow and imagery. i can picture him creating and inventing. Proud of you. This is so good! I had no idea He invented that many things! Good job! Return to Short Story Writing Contest 2011.